Tour the areas within the vineyard region of Washington State known as Washington Wine Country: Tri-Cities, Walla Walla Valley and Yakima Valley. In Washington Wine Country, you will experience award-winning wines straight from the source and often poured by the wine-maker. The region contains the first AVA (American Vitacultural Area) - Yakima Valley AVA, which originated in 1983. 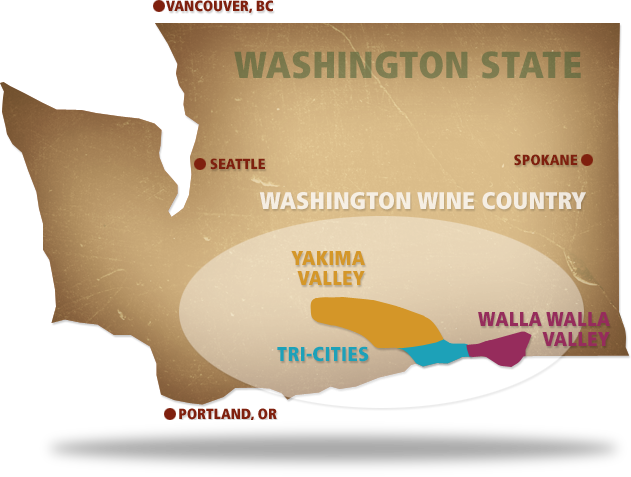 Now, the over 240 wineries in Washington Wine Country include grapes from the regional AVA's of Columbia Valley, Walla Walla Valley, Yakima Valley, Red Mountain, Rattlesnake Hills, Horse Heaven Hills, Snipes Mountain and Naches Heights. © Washington Wine Country. All Rights Reserved.